Anna Emm is best know for the thousands of children's stories that she's written over the past ten years. But, according to her, this genre happened quite by chance â born out of stories she'd written during her years as primary school teacher. She has always seen herself as an author of all genres; her favourites being suspense and romantic comedy. 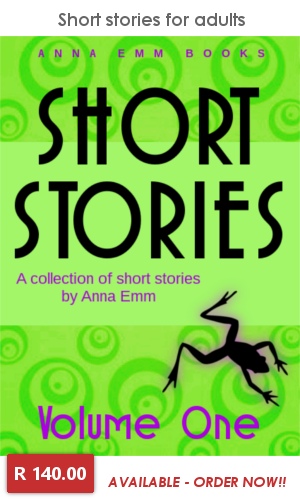 A few years ago Anna decided to write a series of English short stories for adults. These stories were a personal challenge, an exercise, to stretch her muscles and not 'get lost' in the flood of children's stories that were flowing from her pen at that time. Over a period of two months Anna wrote more than 40 short stories, focussing on three diverse genres: romance, fantasy and ghost stories/suspense. For years these short stories lay hidden away in a drawer, their author never really intending to publish them. But with the opening of the first Anna Emm Bookshops in 2017 and the growing demand for a variety of stories, her publishing house decided to release these earlier stories to the public. In this first collection you will find 17 short stories selected from the three main genres â romance, fantasy and ghost stories â all equally intriguing, beautifully written in their simplicity; yet full of detail and sensitivity, revealing the signature style of Anna Emm, e.g. her fine observation of people and insight into human nature. Even in these mere excercises, as she calls them, Anna Emm has revealed herself once again as an extraordinary storyteller. Like all her other books, these stories will string you along, draw you in, and keep you hooked until you have read the very last one. Also get Short Stories Volume 2!